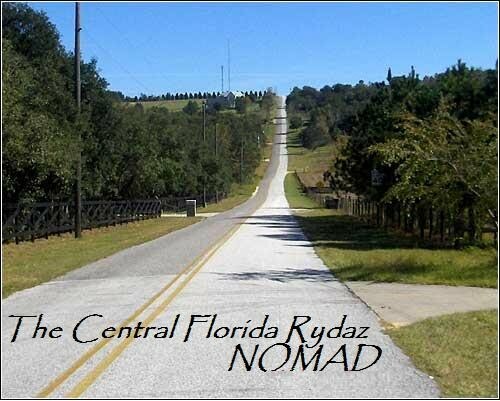 The Central Florida Rydaz NOMAD Chapter is designated for members or associates who do not live in an area with a chartered Chapter, for whatever reason. Some moved away, some went to Prison, it doesn't matter why they are not in a Chapter. Only that their dedication holds them to the CFR no matter the state they are in. They fly NOMAD or Independent because they can't rep Central Florida and for members who hold no particular allegiance to a specific club chapter, but are respected and accepted club wide. For example, if the Club President had a problem with or within a specific club chapter, he might dispatch a group of Nomads to visit the chapter. The Nomads would then observe the chapter and advise the members of any problems the Club President may have. If the infractions were not corrected, the Nomads might then have the authority to correct the problem. Whilst a Nomad does have the right to be hosted by any chapter where he appears, he cannot vote in or have any management responsibility unless directed by the chapter president. Nomads sometimes live in geographical areas which had fewer than the required numbers to form a chapter. They may have chosen to live somewhat solitary lives, or they may have been sent to an area with a mandate to establish a chapter. Since the Nomads are not official members of a specific club chapter, they must be received, housed, and fed by any chapter they may currently be located. They are essentially members of all chapters.